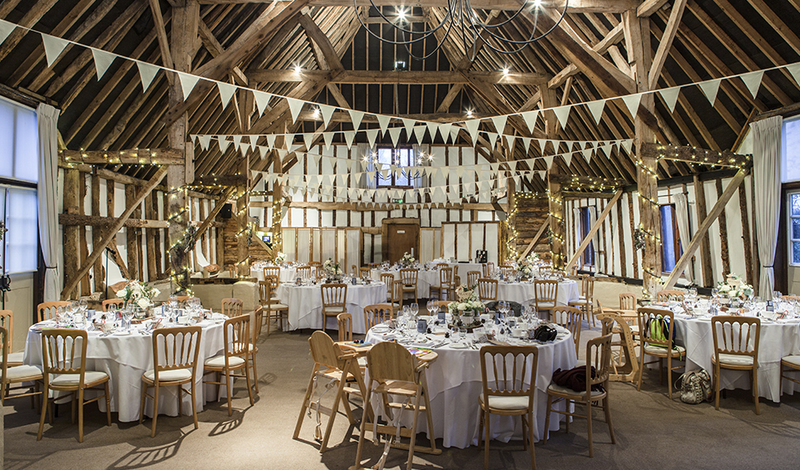 Winter weddings are becoming more and more popular and at Clock Barn, we love these seasonal celebrations. 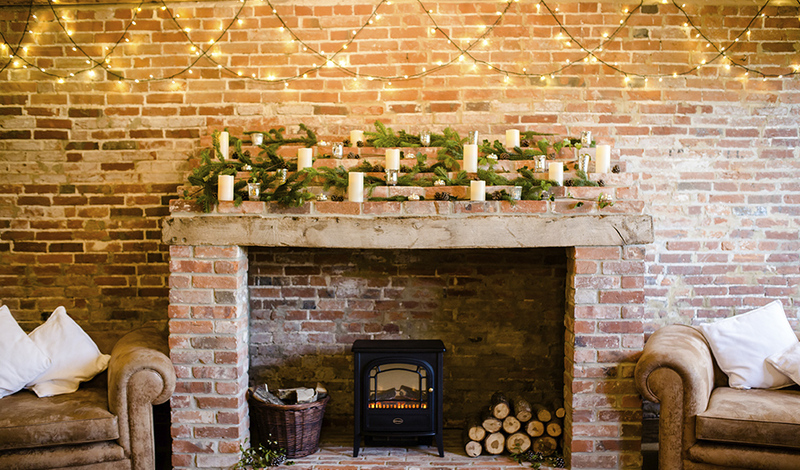 Creating a comfortable, cosy atmosphere is absolutely key and your guests will love the fact that there’s heating throughout the barns so you’ll be sure to stay nice and toasty. However, these little extra touches will help guests wrap up against the winter weather and stay snug all day long. Firstly, let’s just start by saying that a cosy wedding isn’t just about feeling physically warm, it’s about feeling emotionally warm and lovely too. If you think about the hygge phenomenon, that focuses on making sure that we’re relaxed, comfortable, warm and happy in every way. 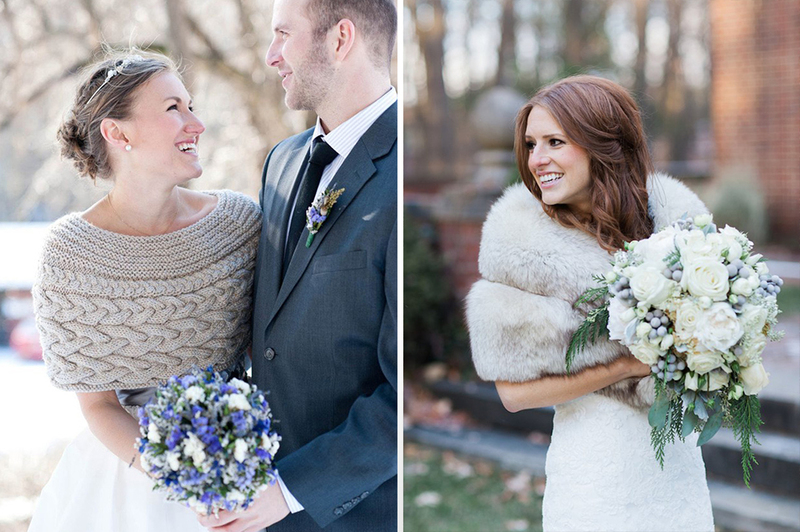 A truly cosy winter wedding will include winter warmers that are good for the soul and well as the body! So let’s start by feeling warm and snug because when you’re wrapped up against the elements in winter, you always feel fabulous. We’ll have the heating in Clock Barn set so you’re all snug but a little bit of warmth is always a good idea, especially if you’re hoping that your guests will join you outside for photos. A basket of blankets is always a good idea. You can pick up fleece blankets in a whole range of colours really cheaply from Ikea and similar outlets. 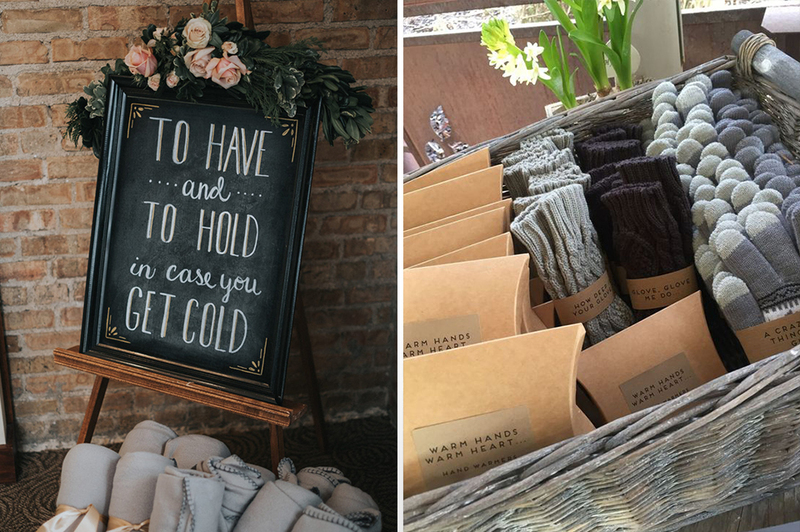 Roll them up, pop them in a basket and add a cute sign so that guests know they’re welcome to take a blanket and wrap up. Alternatively, you can pop folded blankets on chairs for guests to pick up as they arrive for your marriage ceremony or loop them over chair backs in your wedding reception. Another lovely idea would be to gift your guests warming gloves as wedding favours. We know that the saying goes ‘cold hands, warm heart’ but we think both should be warm, especially on a winter wedding day! Also, don’t forget to keep yourself cosy! Heading outside for wintery photos is always a good idea but getting too cold definitely isn’t. There are lots of beautiful wraps and shrugs available or why not opt for a luxurious knit or super cool leather jacket? It’s your day so choose whatever style suits you best. Winter is most definitely a feast season and a delicious menu will certainly warm up your wedding. Our brilliant catering partners, Galloping Gourmet, have so many tasty treats that your guests will love. 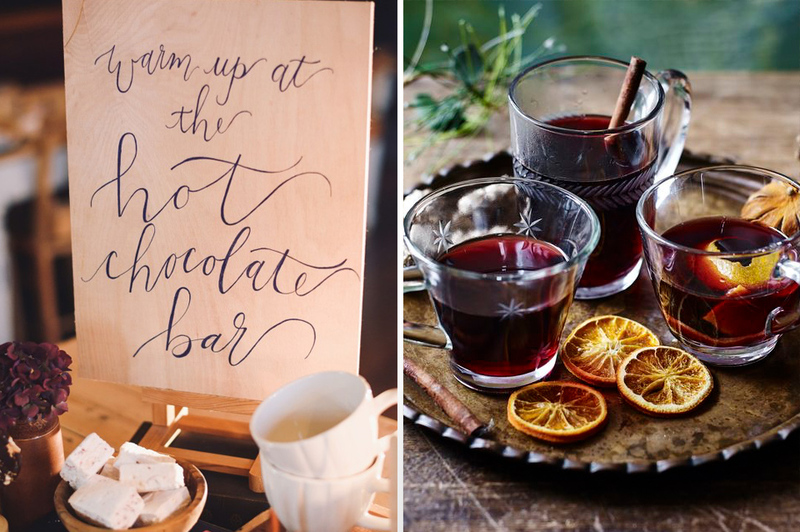 Why not opt for the boozy hot chocolate station? Your guests can choose what treats they add to their tasty hot chocolate and don’t worry, non-drinkers won’t be left out either. Of course, mulled wine and winter Pimms are always popular – who wouldn’t be warmed by those! 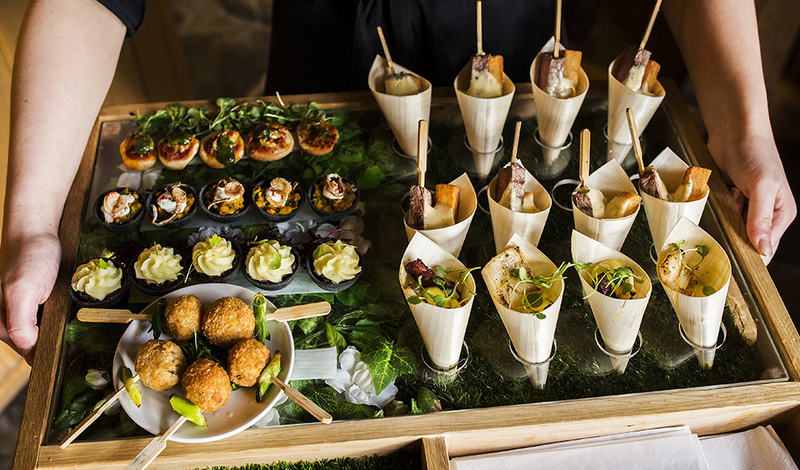 In the colder months, definitely choose warm canapes to serve during your drinks reception. How about local pork sausage with onion rings and chips? Or Thai fishcakes, crispy risotto balls or a scrummy warm tartlet? If you want something a little different, there’s also the option to create a bespoke menu – just speak to the events team. For the ultimate cosy winter wedding meal, how about huge sharing platters? 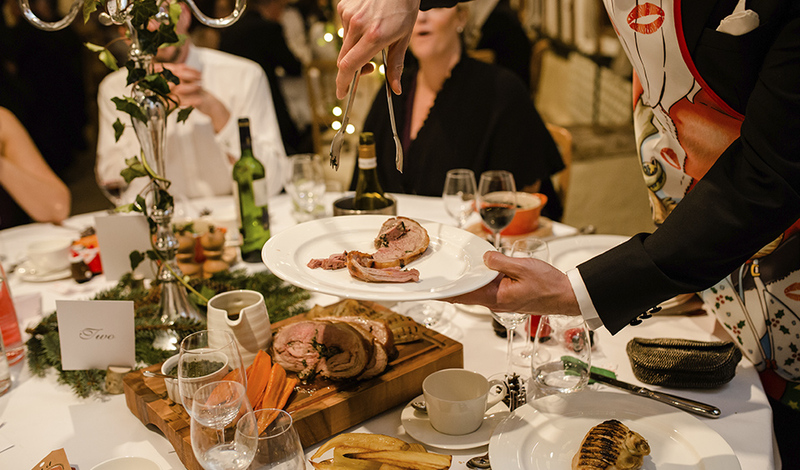 Think how happy your guests will be with beautifully cooked, hearty cuts of meat and all the seasonal trimmings that you could wish for. For a little more fun, let one of your guests don an apron and take charge of serving the rest of the table. After the main feast, don’t forget your evening food. What could be better than wood-fired pizza or a tasty hog roast to warm and revive your guests so that they can party all night long? As we’ve already mentioned, that cosy feeling can be created in a huge number of ways and your decorations absolutely play a part in this too. 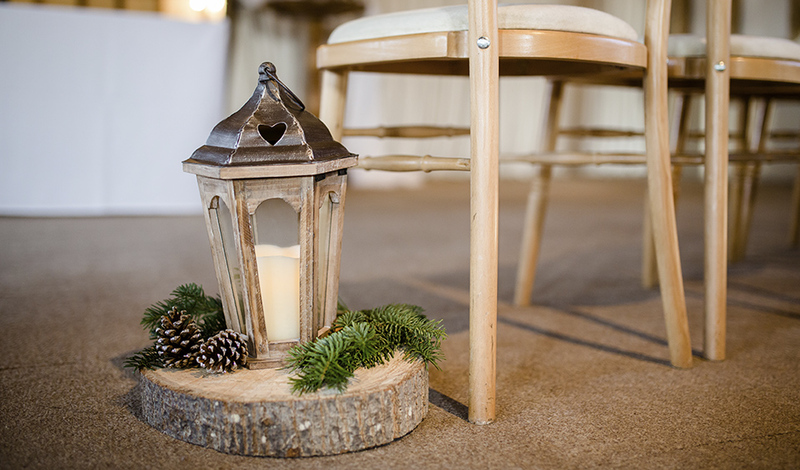 One of the most important things to think about to create that warm winter wedding vibe is your lighting. Clock Barn is already decorated with fairylights for you but add extra lighting to make sure that the atmosphere is warm and relaxing. 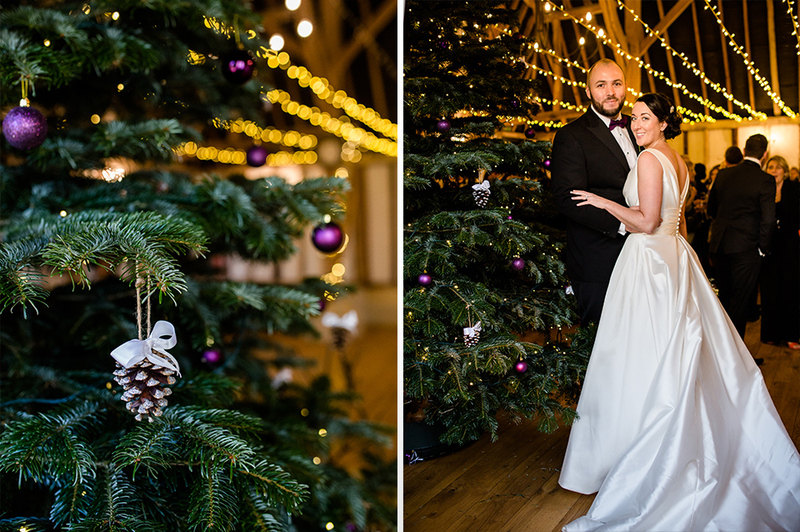 If you’re hosting a December wedding at Clock Barn, you’re in for a really festive treat because throughout the month, a huge 12ft real Christmas tree takes pride of place in the barn. Covered in fairylights, it looks (and smells!) amazing. You can continue the Christmassy feel with your table decorations too. 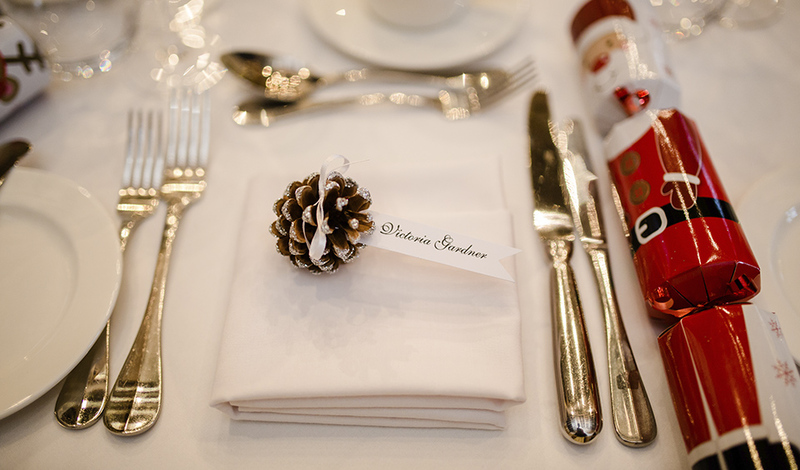 Why not add a sprig from a fir tree to napkins or create your own place card holders from pine cones? You could even follow an American tradition and ask guests to sign a quilt as the cosiest guest book ever! Glowing LED lanterns lining your aisle or placed around the venue look amazing. Why not dress the fireplace in The Stable Room and create a cosy space that your guests will adore? You can also use fairy lights if you’re crafting details for your wedding too. String them in a frame and hang baubles as an alternative table plan or use them to dress a ladder or pallet that’s full of old family photos? That will definitely warm everyone’s hearts. Cosy can also be created with lots of super cute seasonal details. 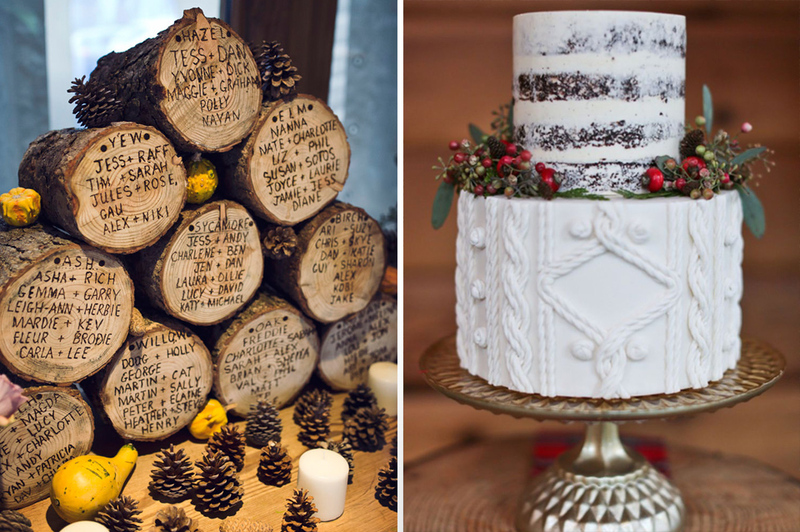 How about using a wood pile to become your seating plan or giving your cake a fab knitted effect – we all love a cosy knit in winter after all! 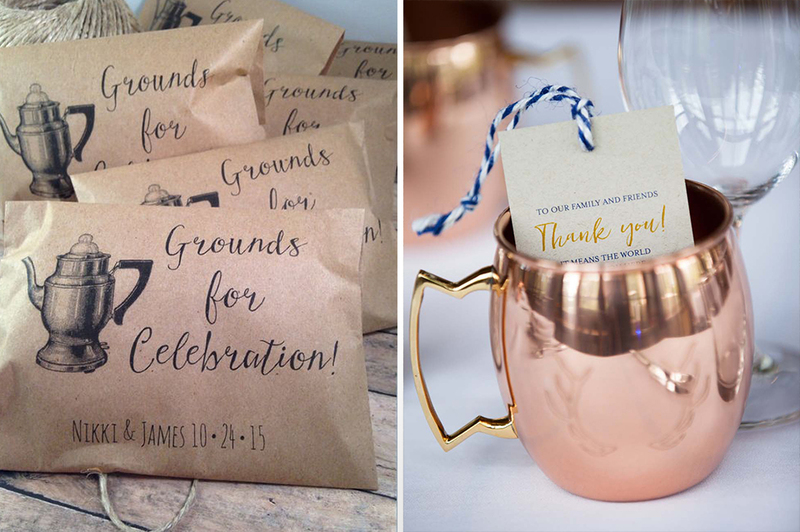 Finally, think about your favours too so that guests feel warm even when they leave your wedding. Hot chocolate mixes to take away, S’mores, personalised mugs or coffee blends are all ideal, especially if your guests need to warm up after their journey home! We’ve also seen lots of fabulously festive favours recently too. Personalised baubles and candy canes have been really well received by guests and we love the Christmassy twist that couples have put on their favours. 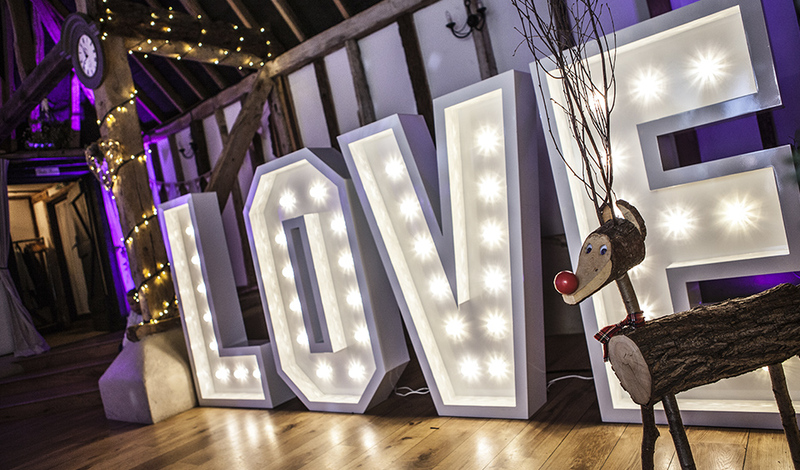 To find out more about winter weddings at Clock Barn, why not visit us? 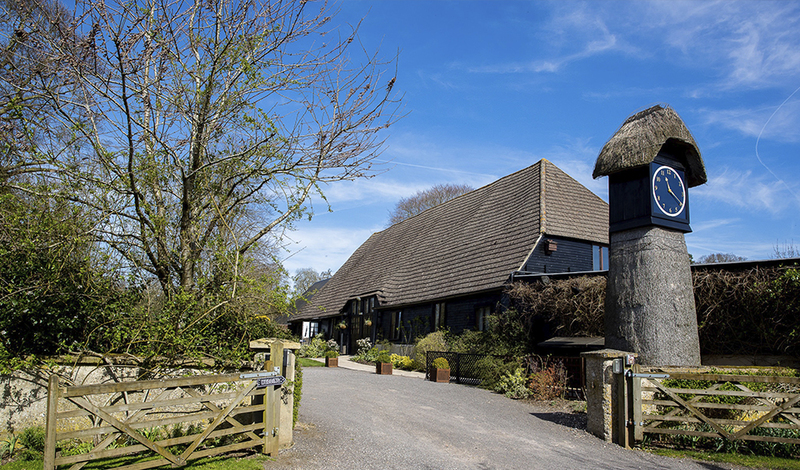 We’d love to show you around so that you can see just how perfect the barns are, at any time of year. Just get in touch to book your visit.